Leaving Facebook has provided me more time to experiment with some of my Pinterest finds. Like this fun Kid’s Kabob which has been prepared a total of 3 times now. 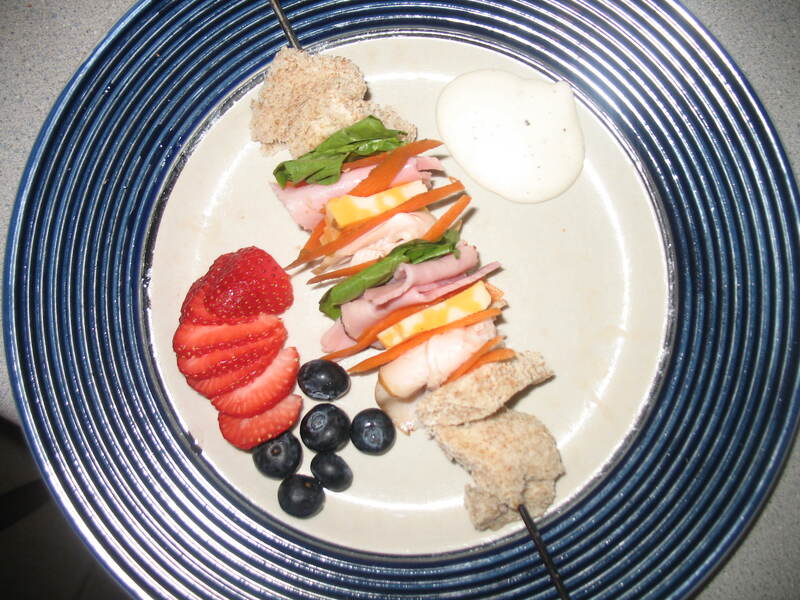 I used turkey, ham, lettuce, carrots, cheese and whole wheat bread on this kabob. I put a strip of bread on first to start the kabob and then began alternating each of the ingredients, ending with another strip of bread at the end. I added some ranch dressing for dipping and some fruit to balance out the meal. Both of my girls ate everything on their kabob, including the veggies so we’ll be making these again and again. We will also experiment using different meats, cheeses and veggies. They are a lot of fun to make and a lot of fun to eat!